Announced at this year’s E3, Assassin’s Creed Origins is already one of the year’s most eagerly anticipated games. And this latest Assassin’s Creed game by Ubisoft Montreal might also end up becoming a hit that reminds everyone why the series once was one of the best-selling and most-loved by gamers the world over. And the latest gameplay video of Assassin’s Creed Origins certainly shows that the developers at Ubisoft might be on the right track with Origins, and will likely be delivering a game that lives up to earlier classics such as Assassin’s Creed II and the superb pirate-themed Assassin’s Creed IV: Black Flag. 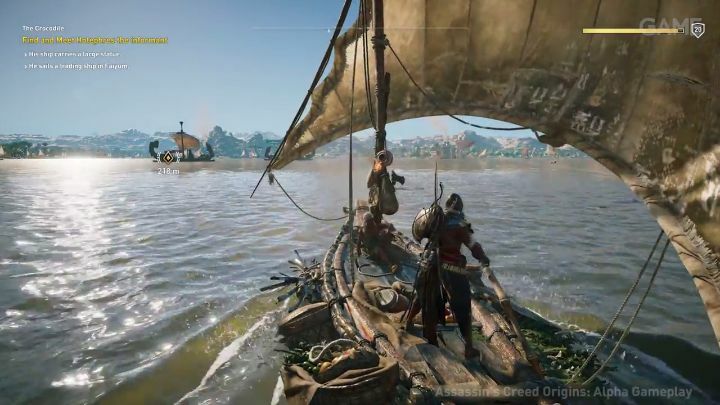 Actually, Origins is being developed by the team behind 2013’s hit pirate game, and this gameplay video shows that sailing will indeed play a part in this upcoming Assassin’s Creed game. He later moves on to a villa in order to grab a valuable item, and we see that the game’s combat and stealth will be quite similar to that of earlier Assassin’s Creed games as Bayek dispatches several guards in order to get to his destination. It all feels a bit more refined than in the earlier games though, plus using Bayek’s bow to take down enemies for afar will likely be a boon in this upcoming Assassin’s Creed too. It’s also clear that Origins will feature spectacular graphics, and judging by this video it looks like Ubisoft Montreal has pulled out all the stops to bring ancient Egypt to life, with the skies, rivers, towns and people looking great in this gameplay demonstration. Actually, this was captured from 4K footage running on Microsoft’s upcoming Xbox One X console, meaning those who get to play this version of the game are in for a visual treat. Here’s hoping, then, that Assassin’s Creed Origins ends up being the game that restores our faith in Ubisoft’s award-winning franchise, after Assassin’s Creed Unity let many down due to its buggy release back in 2014. Although we will definitely find out whether this Assassin’s Creed game swims or sinks when it finally hits shelves this fall, something quite a few gamers will be looking forward to no doubt. Next: Half-Life gets new patch 19 years after launch – could this be about Half-Life 3? Half-Life gets new patch 19 years after launch – could this be about Half-Life 3?